Washington (CNN) – Florida Sen. Marco Rubio will introduce Mitt Romney at the Republican National Convention when the former Massachusetts governor officially accepts his party’s presidential nomination later this month in Tampa, a senior Republican official told CNN. 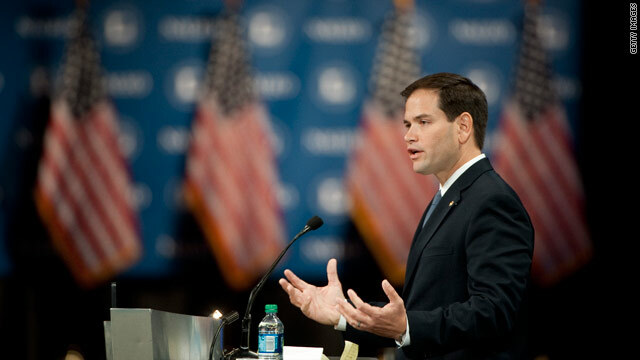 Rubio, who was elected in 2010, is well regarded by conservatives and tea party activists. Earlier this year, Romney had said that he was looking at Rubio as possible vice presidential running mate. Romney, instead, chose Wisconsin Rep. Paul Ryan this weekend to join him on the GOP ticket. Rubio, who campaigned with Romney in Florida on Monday, told CNN that he thinks the former Massachusetts governor made the right choice in choosing Ryan. The Tampa Bay Times was the first to report that Rubio would be given this prime speaking role. "Please Mr. Romney, you promised me that if I sell my soul and my people down the creek, I could join the "good old boys club", I know I did not deliver, but you know that Obama is a sly one, he is . . . President Obama is like an owl and a fox in one. It's almost like he knows what we are going to do before we do it. Now this is not black mail but I can't go back to my people for they have disown me, I am far worst then the proverbial "Parodical Son" I can never go home. So, it's like this Mr. Romney, If you don't give me something on this ticket, I will tell the people everything I know about your taxes and underhanded misdeeds" Ok, Ok, says Romney, "you can introduce me at the convention. Oh what a tangle web we weave. I wonder how this mends his broken heart for not being picked for the VP slot.